Emerald Town is a beachside suburb of Central City. It features as the first overworld area visited in Sonic Battle for the Game Boy Advance. 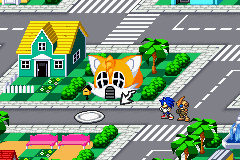 Sonic Battle describes Emerald Town as "The place where Sonic and his friends live" (at the very start of the game, in the forward to Sonic's episode); and Tails, at least, maintains a house and laboratory there. Sonic Battle opens with Sonic discovering a damaged and bedraggled Emerl abandoned on Emerald Beach. He decides to take the robot to Tails to see if it can be repaired, but is waylayed first by a curiously enfeebled Shadow, then by Rouge the Bat, both of whom warn him not to let Dr. Eggman get his hands on the robot. Tails mentions that a machine much like Emerl has been reported as robbing jewelry stores in the area, although with the appearence of the E-121 Phis it becomes obvious that Eggman is responsible. Due to the non-linear nature of Sonic Battle's stages, other characters return to Emerald Town in their own episodes, typically to visit Sonic (who can usually be found training at Emerald Beach), or Tails' lab for the reassembly of Chaos Emeralds from their shards. Rouge also comes to the district, like the E-121 Phis, to rob a jewelry store with Emerl's help. While most fights in the Battle Highway arena occur in Central City proper, a few confrontations in Sonic's Episode take place in the street right outside Tails' house; including the game's very first fight, against Shadow. Sonic's preferred training ground, Emerald Beach is where the blue hedgehog confronts Rouge. This is also where Sonic and Tails take Emerl for some of their knock-out practice fights. Tails' lab is the fox's own training area, and the first place in the game where Sonic and Emerl come under attack from Eggman's Phi-series robots. Aside from the physical battle area, the lab also contains... ...A virtual reality training environment, which can conjure up locations from all over the game, as well as this traditional Tron-style Colosseum. It is only by consecutive victories in the VR training that Emerl can unlock his Ultimate-level techniques. Emerald Town receives a mention in Sonic Chronicles: The Dark Brotherhood; as the area of Central City to which Sonic and co. return the child rescued from the Green Hill Zone giant scorpion cave. Here, however, the area is neither particularly tropical nor beach adjacent. One of the houses resembles Tails' head. This page was last edited on 17 January 2019, at 13:01.